M.V. "DISCOVERY" has been sailing for VOYAGES OF DISCOVERY since 2002, the ship was originally built as the ISLAND VENTURE in 1972 and became famous for the TV series "THE LOVE BOAT", today a classic, the ship is still going strong with a busy schedule for 2013, unfortunately her sister ship the "PACIFIC" is still facing a very uncertain future laid-up in Genoa, still defiant though. 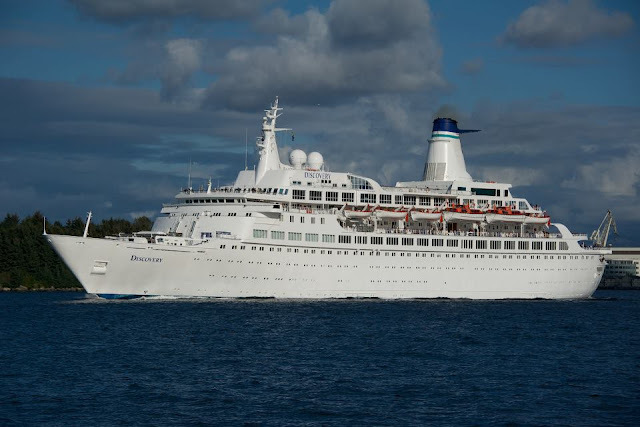 "DISCOVERY" is 20.186 GRT with capacity for 650 passengers and cruises at 18 knots. Photos above by Harald Oanes and Joao Abreu, bottom photo, one of her diesel engines, taken from the internet. 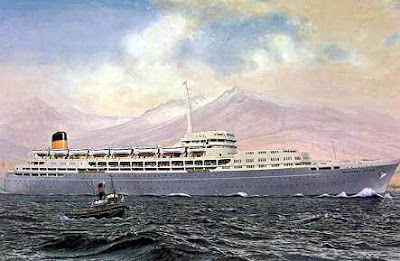 In the early seventies with the decline in passenger numbers travelling on regular liner voyages, LLOYD TRIESTINO promoted their Australian regular services with the sister ships "GALILEO GALILEI" and "GUGLIELMO MARCONI" with return trips home via the Panama Canal and the Caribbean in order to try and attract more passengers, in 1973 they went a step further with the decision of sending both ships on around the world voyages, MARCONI did a couple of trips and the GALILEO just one. 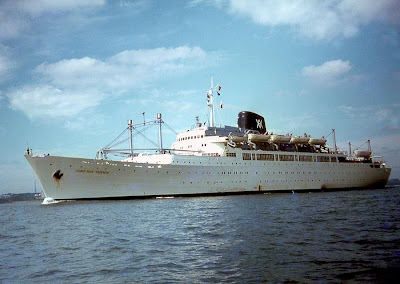 On my new blog about MARCONI, I am going to relive one of those trips with daily posts following the ships progress day by day back in 1973, the ship departs on the 25th of August from Genoa, in order to follow this epic sea adventure, please visit http://vmf-guglielmomarconi.blogspot.com. 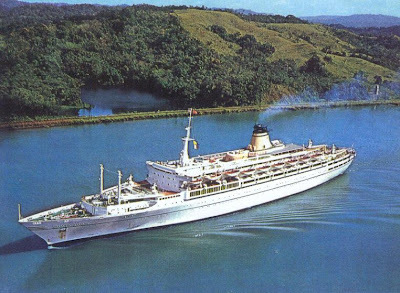 Photos above, GALILEO GALILEO cruising the Panama Canal, GUGLIELMO MARCONI ready to cross the canal and the ship at sea. "AMADEA" was built in 1991 by MITSUBISHI HEAVY INDUSTRIES at Nagasaki as the ASUKA, the ship was sold by their owners NIPPON YUSEN KAISHA in 2006 to AMADEA SHIPPING CO., she was renamed "AMADEA", since then the ship has been on charter by the German based company PHOENIX REISEN. 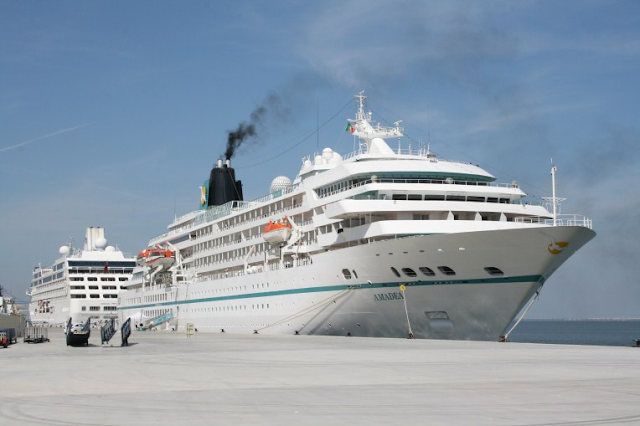 "AMADEA" is 28.856 GRT, cruises at 20 knots and has capacity for 620 passengers. Photos above taken by Rui Agostinho in Lisbon, 30.5.2012, the OCEAN PRINCESS can also be seen on the top photo. There is another post on this blog called "the incomparable EUGENIO C", dated 14th December 2011, this is why this is part 2, further episodes of this amazing ship to follow in the near future. 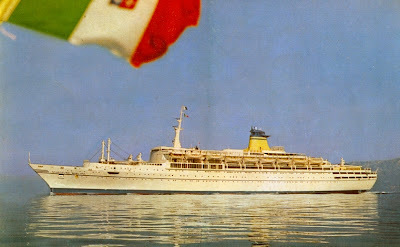 After the number of passengers using the Italy/South America dropped dramatically in the late 70's, LINEA C like the majority of shipping line companies decided to employ their ships on cruising, so the "EUGENIO C" was of course no exception, she started cruising mainly after 1984 when she was renamed EUGENIO COSTA, she is seen here above in Lisbon in 1986, she was one of the most amazing passenger ships I have ever known, got fond memories of her, memories that will stay with me forever and makes me think how priviledged I was during those memorable years, years of decline for the liners, but still a lot of them remained for many more years.